The Tour Hassan: Symbol of Rabat, Morocco, Sultan Yacoub El Mansour (12th century) wanted to build the largest mosque in the Muslim world, after that of Samarra. Unfortunately, the work was abandoned after his death in 1199. The tower was reaching more than 60 meters, but only reached 44 million. Originally the minaret was built to house up to 40,000 people. The Mausoleum of Mohammed V: the royal tomb that houses the tomb of Mohammed V and his son Moulay Abdellah and Hassan II. Kasbah Oudayas: inside you can visit an old military prison, gardens, museums and the famous blue and white streets of Oudayas. Night and dinner at the hotel in Rabat. After breakfast, departure to Meknes the imperial city, of most striking Morocco; Upon arrival in Meknes Visit of Bab El Khamis, next to the old Mellah de Meknes; Walk through the streets of the medina They all diverge towards the Great Mosque; Visit to the Idrissidas palace; Visit the Bou Inania madrasah, a masterpiece of Arabic architecture. Rama Place Hédim: ignore its remarkable collection dedicated to the Tafilalet region. Visit the Mausoleum of Moulay Ismail, Meknes and missed one of the few religious monuments of Morocco open to non-Muslims. Visit Sahrij Souani: constant previously used for the storage of the city's food reserves; Royal Academy branch to visit the famous livestock of Meknes: center for the breeding of thoroughbred horses. Departure to Volubilis to visit the house of Orfeo; Visit the Capitol Square. 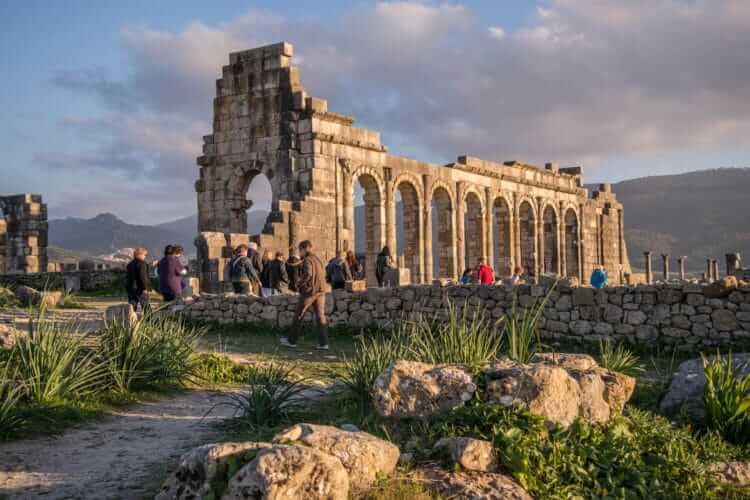 Visit the triumphal arch with ascending pride in Volubilis. From there a beautiful view of the Zerhoun plain. After breakfast, tour the city of Fez. We begin our tour of the city through the Bab Boujloud gate that includes a beautiful esplanade in which every year the free concerts of the Fez Festival of Sacred Music of the World take place. Tanner District is in the heart of the medina of Fez el Bali, this is the leather tanneries that is produced using the same old methods. The tanneries were established here since the Middle Ages. This is one of the most spectacular places in the medina. Karaouine Mosque: One of the largest religious structures in Morocco. This mosque is located in the heart of the medina. The university attached to the mosque was the center of Islamic learning in Morocco for more than 1000 years.